This post is dedicated to all the farmers, primary producers and supporting industries that supply us with our basic need : FOOD. On Easter Monday, we visited the Sydney Royal Easter Show. I love this spectacular display of the strong agricultural basis of the state. I grow veggies at home and own some chickens, so thinking about all the growing that occurs on the huge commercial scale is just incredible. Australia is an amazing place to be able to produce so much produce and of such high quality. Up at 6am, caught 7am train to Homebush, dived into the show and got lost amongst the chickens, alpacas, horses and other animals. The male turkeys gave us a display which made us all laugh. They spread their tails, strutted around the cage, lowered their snood, and gave us a “gobble, goobble, gloobbley GOOP” ! My favourite display is always in the Art and Craft Pavilion. Some other favourites that I have not included pictures of include the Giant Food Art displays, the Pig Diving, the Grand Parade, the Dog Shows, the Sheep Shearing. There is so much more to see and do, so the next time I visit, I think I might get a 2 day pass so I actually get to see everything. Hi I am an alpaca. The sheep are in the next shed. Amazing! Where’s my cup of tea? 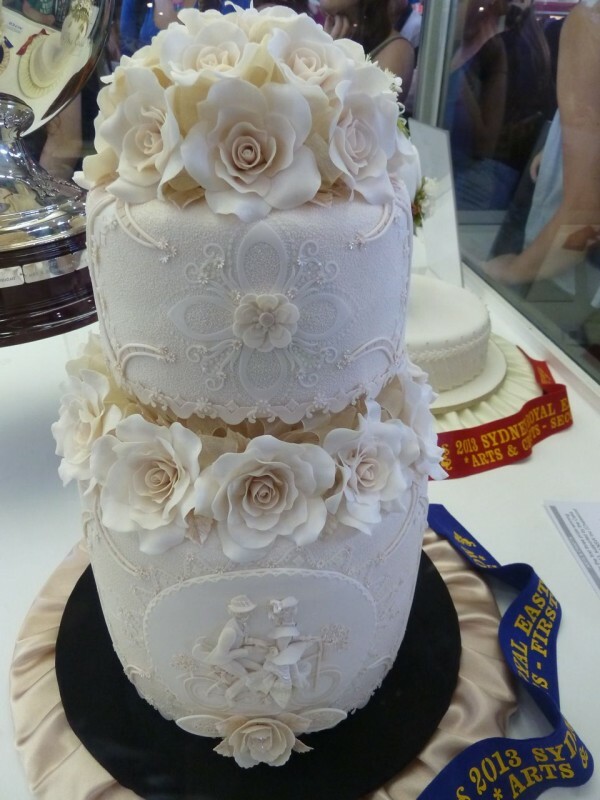 First Prize winner SREA2013 Wedding Cake. Just Incredible. Last stop : kids got home happy.